Page 3 - Westward, Ho! This is the story of one branch of the Dibble family. Dibble is, in fact, a fairly uncommon name. But in a world of seven billion humans, even the uncommon names are borne by hundreds of thousands of people. Our branch of the Dibble tree encompasses, by now, about 1,000 souls, living and dead. 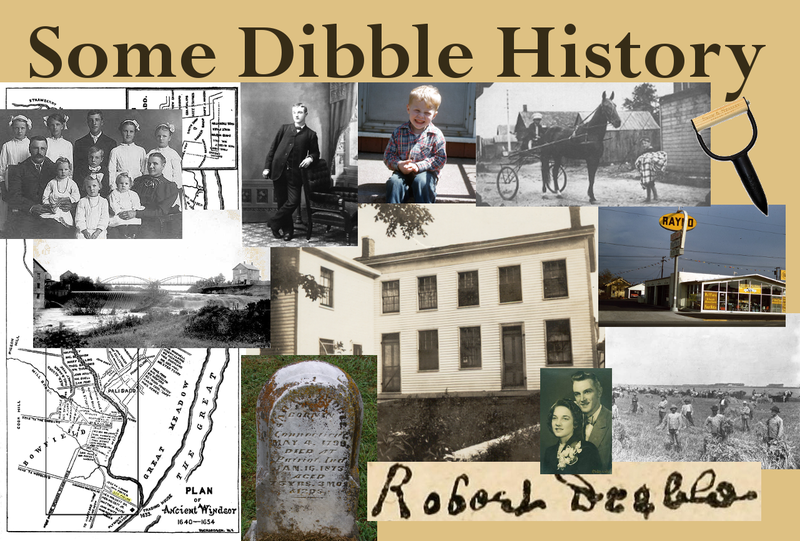 We are the descendants of John Dibble, scion of one of a number of ancient Dibble lines, who traveled from Connecticut to Indiana between the War of 1812 and the Mexican-American War. We are also the descendants of hearty Scandinavian pioneers, the Moruds and Haldens and Johnsons, who broke the sod and braved the rigors of the Minnesota heartland. And we are the descendants of the eastern European Flakiewicz family, who passed through Ellis Island in search of something, anything, that might be better than servitude at the bootheel of a foreign imperial power. This is such an American story. In its embrace of the icons of United States history--the patrician English line, the hardy Northern European plains settlers, and the late-arriving, secretive immigrants whose names are full of consonants and mystery--it is almost ridiculously stereotypical. But as everyone knows, stereotypes are rooted in truth. This, then, is our truth, as we are able to understand it today. As is the case with all "truth" in the imperfectible minds of human beings, it is subject to change. It is subject to improvement. But in its essential form, it conveys the reality our ancestors faced. It demonstrates the imperatives that all people face: Change your surroundings, or be changed by them. Patterns emerge from these disparate stories of people brought together by blood or by choice. Can you see them? Can you see yourself in them? The Dibble name in North America goes back to the earliest settlements. The name "Dibble" has many variations, including Dibblee, Dibbell, Daboll, Dible, Dibol, Deble, Deeble, and more. Spelling just wasn't very important in the English language before the 19th. century. Many people bearing these names are part of one huge interrelated family; many others clearly are not. There are at least two coats of arms associated with the name, and both prominently feature the gardening implement known as a dibble or beansetter. However, it remains to be seen whether these alternate spellings or coats of arms have any relevance to the Dibbles of southeastern Indiana and Cannon Falls, Minnesota.